What was on the site of The Registry of Deeds building before the Archives moved in? 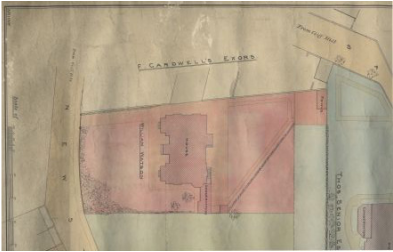 This plan shows the area of Wakefield that is now the site of the Wakefield Archives and Registry of Deeds building. The firm of Watson Architects created this plan showing how the area looked in the 1800s and we can see that William Watson Senior himself lived on the site that later became the Registry of Deeds. The Watson family designed many buildings over two centuries, from Wakefield to many other places in West Yorkshire. Some of the buildings they are linked to include: The White Rose Hospital, War Memorials at Wakefield Grammar School, Sandal and Newmillerdam, Wakefield Technical College and parts of Clayton Hospital. Watson Architects includes the work of three generations of the same family and as a result of this there are a vast amount of plans retained in this collection. Started by William Watson, his son William Harold Watson then joined the firm located at Barstow Square, Wakefield also along with another partner F. B. Ellison. After his fathers death in 1901 and Ellison leaving the firm he was sole partner until his son William Eustace Watson joined the firm in the early 1940s. William E Watson then continued the firm after his fathers death in 1946. Wakefield holds a number of architects collections including Garside and Pennington of Pontefract [C981] and J G L Poulson Limited also of Pontefract [C391], which also include plans of significant local buildings, but Watson Architects was a family business and has much older plans of the Wakefield area.